The removal of the Twickenham cycle and bus lanes continues to get lots of attention both inside and outside the borough. Twickenham based blog Twickerati covered the story. It made it onto page 2 of this week’s Richmond and Twickenham Times as well as the letters page. Outside the borough, Cyclists in the City and Merton based CycaLogical both covered the story. 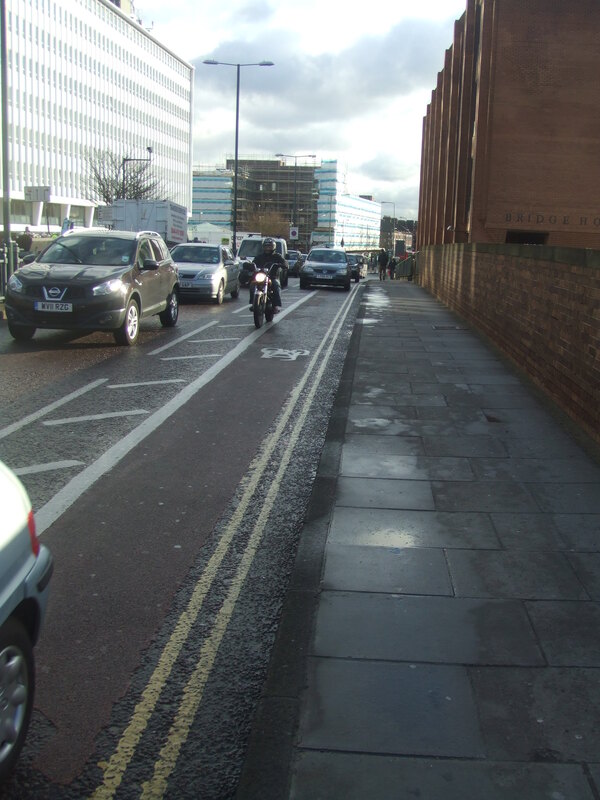 So, instead of a standalone all day mandatory cycle lane (as per the above photo on London Road) or bus lane (as on King Street), extra lanes for motor traffic will pop up with off peak advisory cycle lanes shared with the nearside motor vehicle lane. Our thoughts? The Highway code advises motors on advisory cycle lanes ‘Don’t use unless unavoidable’ which effectively renders them not legally enforceable due to the interpretation of the word ‘unavoidable’. 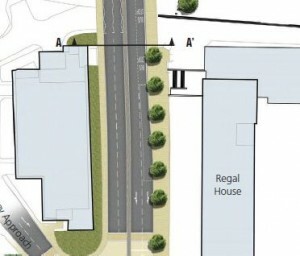 Motorists can and do enter them, particularly with the design proposed by the council where the cycle lane is part of, not in addition to the inside traffic lane. The reality is you’ll have a motor vehicle sitting impatiently on your rear as you use these cycle lanes, or overtaking dangerously, regardless of time of day. There is likely to be a greater incidence of pavement cycling on the wider pavements as cyclists are intimidated off the road and fewer people choosing to cycle through and to Twickenham. But this isn’t just about cyclist safety – pedestrians and bus users also lose out to ease traffic flow. Indeed, one councillor went as far to say “bus passengers in Twickenham were ‘spoiled’”. Over 650 residents have signed a petition against moving the bus stops. We asked for the subject of the cycle lanes to be included in the upcoming Cycling Liasion Group Meeting, but the council have refused to discuss it (a local blogger has previously covered the effectiveness of the CLG). UPDATE 1st October – The Council has now relented and added the subject to the meeting, but with provisos. We’ll be there, come and make your voice heard. So this leaves the Council Cabinet meeting on 18th October as the last opportunity to raise your concerns alongside us. Please read the ‘what can we do’ section at then bottom of this post and make your voice heard – write to the R&TT; write to your councillor; come along to the council’s Cycling Liaison Group meeting on 4th October; come along to the Council Cabinet meeting on 18th October. 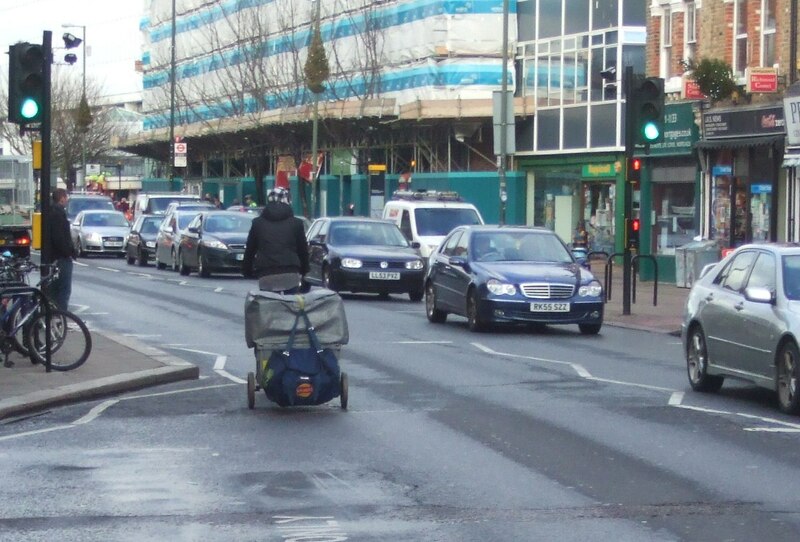 Perhaps we should have realised that it was too much to get our hopes up when LBRUT issued a press release showing that over two thirds had rejected the council’s proposal to remove the London Road cycle lane. We had hoped the council would listen to this strong message and not only retain and improve this lane, but look to provide high quality cycle infrastructure across the borough. It had been a long struggle, but perhaps, just perhaps they would listen. Sadly we now learn that is not going to be the case. On Wednesday 19th September, the council debated the consultation and we’re informed that the council believes that the introduction of a 20mph limit, the removal of the bus lanes and removal of the cycle lanes would safeguard cyclists. On 18th October, the council will meet to make it’s final review and it is likely that they will support the removal of the lanes. Firstly, this goes against the Government’s own guidance. The Department for Transport states that on roads with greater than 8,000 vehicles per day, cycle lanes should be provided, even if the speed limit is reduced to 20mph (Table 1.3 in this document). Twickenham has 10,000 to 20,000 vehicles per day (TfL Statistics – PDF). Given that at busy congested times the traffic barely crawls, a 20mph speed limit isn’t going to have much impact. The council is extremely reluctant to introduce 20mph zones elsewhere in the borough (despite their benefit being shown by one of their own reports), putting in the barrier of requiring a referendum with 51% of residents needing to vote yes for it to pass. Note that is 51% of residents, not respondents, so a no response counts as a No vote. Image if that was applied elsewhere… Meanwhile, nearby councils like Surrey County Council are pro-actively introducing them. This leads us to believe that the intent of the change is improving traffic flow, at the expense of cyclists and pedestrians alike. Secondly, while the current council has history in not listening to RCC, with the current Cycling Czar constantly telling us to stop campaigning about safety, it is now ignoring a growing number of residents who value cycling as a means to get to work, to the shops or to take their children to school and want to do so safely. You can understand their concern, given the significant increase in road injuries suffered by cyclists in the borough shown in the latests TfL statistics (1 every 4 injuries from a road incident is to a cyclist). The breakdown of the responses to the consultation are available online, and there is an overwhelming majority against the cycle lane removal. Why go to the expense of a consultation if you are going to ignore those who took the time to fill it in? This is a real missed opportunity to turn Twickenham into something more than somewhere to drive through on the way to somewhere else. We’ve previously posted on the Twickenham Area Action Plan and we submitted a very detailed analysis of their previous proposals which you can read online. We looked at cycle routes through Twickenham in a review in 2009 and a further review in 2012 and we also looked at Twickenham Railway Station in detail in 2010. Sadly, all of this has been ignored. 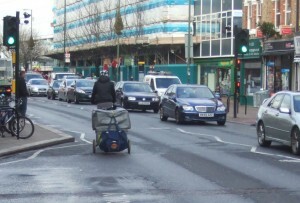 The next Local Elections are in 2014 and like last time, we shall be asking the candidates for their views on cycling. As part of this, we’ll also look at how they have voted on issues affecting cyclists, such as the Twickenham Area Action Plan.